The perfect plot at a bargain price for a quick sale. This excellent plot of 632sq.m. with sea and mountain views to Kefalonia and Alikes located in the traditional Greek village of Kallithea is a bargain not to be missed. The plot is flat, rectangular and in a quiet location only a short walk from all amenities. 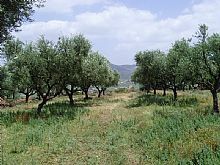 It`s surrounded by countryside and contains olive trees. Centrally located Kallithea is a quiet, beautiful village rich in history and nature located at the foot of the mountains and surrounded by countryside. The village has a supermarket, butcher, bakery, pharmacy and a medical centre. It is 6kms from Alikes and Alikanas and 12kms from Zakynthos town. The nearby beaches of Alykes, Alykanas, Psarou and Amoudi are known for their golden sand and shallow clear blue waters. The municipality of Alykes in which Kallithea is located has a rich history with many ancient buildings, churches dating back to the 16th century, old caves and the people have a genuine warmth and friendliness. In Alykes and Alikanas there is plenty of entertainment with a wide range of bars and tavernas for all tastes and shops offering a wide range of products at reasonable prices.